Hyundai's zero-emissions, hydrogen-powered Tucson Fuel Cell vehicle continues to satisfy and attract new customers focused on high-versatility and clean transportation. For 2016, the Tucson Fuel Cell adds convenient HomeLink® connectivity to the mirror, allowing owners to open and close garage doors, security gates and even control home lighting systems via a button on the rearview mirror, which now includes a digital compass. In addition, Tucson adds two new exterior color options to Winter White: Hydro Blue and Chromium Silver. "At Hyundai, we strongly believe that hydrogen-powered fuel cell vehicles represent the next generation of zero-emission vehicle technology, and we're proud to be a leader in offering the mass-produced Tucson Fuel Cell to our customers," said Dave Zuchowski, president and chief executive officer, Hyundai Motor America. "Every day, these customers are enjoying the benefits of refueling speed and superior range that compare favorably with gasoline vehicles, providing a seamless transition from traditional vehicles with minimal loss of utility. We're confident that advancing fuel cell technology will increase the adoption of zero-emission vehicles, and that everyone will benefit." The Hyundai Tucson Fuel Cell has also received strong support from government agencies, such as the California Air Resources Board. "These ultra-clean vehicles play a critical role in our efforts to clean the air and meet our climate goals," said Air Resources Board chairman Mary D. Nichols. "Fuel cell cars are not vehicles of the future – they're here now, and we applaud Hyundai for bringing them first to market in California where they are most needed." The Tucson Fuel Cell lease program remains unchanged for 2016. Customers in the Los Angeles/Orange County region can drive Hyundai's next-generation Tucson Fuel Cell for just $499 per month for a 36-month term, with a $2,999 down payment. This includes the addition of a remarkable benefit – unlimited complimentary hydrogen refueling and At Your Service Valet Maintenance at no extra cost. "When we spoke with customers about fuel cell vehicles, many wondered about the cost of hydrogen," explained Mike O'Brien, vice president, corporate and product planning. "To ease those concerns as the hydrogen refueling network builds out, we decided that covering this cost for these early adopters was appropriate, and consistent with how we like to treat our customers." In addition, Tucson Fuel Cell owners will enjoy similar services enjoyed by Hyundai Equus owners, such as At Your Service Valet Maintenance, at no extra cost. 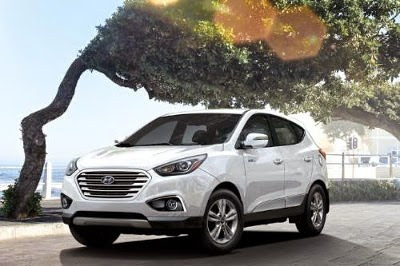 Similar to what Equus owners have enjoyed since its introduction in 2010, should a Tucson Fuel Cell require any service, a Hyundai dealer will pick up the vehicle and provide a loan vehicle, then return the car after service to the customer's home or business, at no charge. Customers interested in the Tucson Fuel Cell can indicate their interest (the first step in the ordering process) by visiting Hyundai.com. Retail consumers can find availability at three select southern California Hyundai dealers: Win Hyundai in Carson, Tustin Hyundai, and Hardin Hyundai in Anaheim. Availability of the Tucson Fuel Cell will expand to other regions of the U.S. consistent with the accelerating deployment of hydrogen refueling stations. Hyundai has developed its Tucson Fuel Cell to alleviate some of the range and utility limitations of traditional battery electric vehicles. The Tucson Fuel Cell maintains the day-to-day flexibility of the gasoline-powered Tucson, so that its driver is able to fulfill their transportation needs without range or recharging-time concerns to their lifestyle. The Tucson Fuel Cell began mass production in February 2013 at the Ulsan, Korea assembly plant that also manufactures the Tucson gasoline-powered CUV. Manufacturing the Tucson Fuel Cell at the same plant allows Hyundai to leverage both the high quality and cost-efficiency of its popular gasoline-powered Tucson platform. The benefits of hydrogen are well known - required supplies for the U.S. market can be produced domestically and its supply is virtually unlimited. It can be produced by varied means - including renewable sources such as biogas. 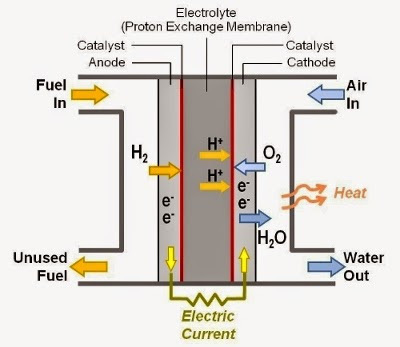 Hydrogen can even be sourced directly from water, using electrolysis to split hydrogen molecules with electricity from renewable energy sources such as wind and solar. Further supporting hydrogen infrastructure development, California approved a plan in 2013 to develop up to 100 hydrogen refueling stations in the state over the next several years. This recent California initiative dovetails with increased government support of hydrogen infrastructure development at the federal level, such as H2USA. In addition, the California Energy Commission recently announced proposed awarding of $44.5 million for the development of 28 new hydrogen stations (plus one mobile refueler), bringing the total number of hydrogen fueling stations (open, in-development, and proposed) to over 50 stations. Hyundai's fuel cell effectively replaces the battery pack used in an electric vehicle by generating electricity from hydrogen through an electrochemical process that does not involve hydrogen combustion, with no moving parts within the fuel cell stack.